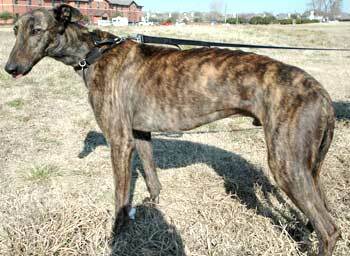 Challenger, aka FMC Challenger, is a handsome dark brindle 2½-year-old male, born August 17, 2002. His sire is DA Challenger and his dam is ATD Fired Up. 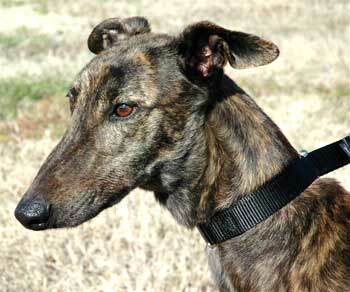 Although Challenger is registered with the NGA, there is no record of races on Greyhound-Data.com. Challenger was found as a stray on the grounds of the Mesquite Archery Range, and GALT was contacted by one of their members, Sue. Challenger has a wound on his right rear foot that is being medicated and watched carefully. Challenger is a friendly boy. Challenger is small animal tolerant. Challenger is a very sweet and loving boy. 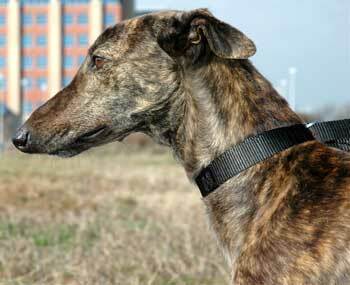 He lives in a foster home with two greyhound brothers and two cats. He has barely looked twice at the cats  so I feel very comfortable that he is cat tolerant. Challenger is the typical greyhound - enjoys just hanging out wherever I may be in the house. He isnt very fussy and will often just pick a random rug to lay down on - if it happens to be close to his foster mom. Challenger is a younger boy and still has a very playful side - although much calmer than a puppy. He loves to play with his stuffed animals - often throwing them up in the air and chasing them. He also really enjoys his rawhide chewies  he will spend hours chewing on them. Challenger is also a very happy and affectionate boy  often laying on his back as if asking for a tummy rub down. And of course, his favorite time of the day is when we all go for a walk. Challenger does well in his crate, as well as being trusted in the house. He sleeps in the master bedroom with his greyhound brothers and is always excited when he hears the alarm go off. Guess he knows its time for breakfast. He runs down the steps snorting out of excitement. Challenger would be happy in a home with or without other dogs. Although he has not spent a lot of time around children, he does seem to be very patient and easy going around them.